ey all just smiled and seemed so happy at their jobs. EXCELLENT PLACE. I will tell others about it. I hope to back there soon." 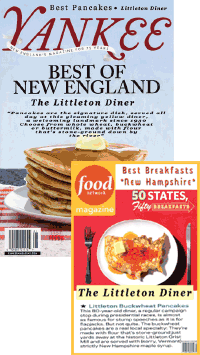 "My wife and I travel to NH a couple of times a year and always enjoy visiting your restaurant. Your staff is FRIENDLY and POLITE, your restaurant is always CLEAN and COMFORTABLE and your food is excellent." "I have homes in Montreal, NH, RI and Florida and I have to say I love your place. I always can't wait to have breakfast at the Littleton Diner. YOUR WHEAT PANCAKES ARE THE BEST ON THE EAST COAST. I travel from Montreal to Florida so I know this to be true." "We always make it a point to eat out at the dinner. Whenever our friends and family visit us up here we ALWAYS bring them to Littleton Diner. We even bought 4 shirts from there as gifts last year. MY FAVORITE IS THE MEATLOAF...."